New Zealand’s prime minister set a timeline for her government to draft stricter gun laws, but didn’t reveal specific details after a meeting with her cabinet following Friday’s deadly mosque shootings. “Within 10 days of this horrific act of terrorism we will have announced reforms which will, I believe, make our community safer,” Prime Minister Jacinda Ardern said Monday in a news conference following the meeting, according to Reuters. Ardern said her cabinet is “completely unified” in changing the country’s gun laws, even though they were only able to reach “in principle” agreements Monday, reported The Guardian. She was expected by some to announce a ban on semi-automatic rifles after her attorney general called attention to the plan Saturday. “I strongly believe that the vast majority of gun owners in New Zealand will agree with the sentiment that change needs to occur,” Ardern said, according to CNN. New Zealand law allows semi-automatic weapons limited to seven shots, according to Reuters. A gunman in one of the mosques used a semi-automatic weapon with a large magazine in live-streamed footage of the attack. A New Zealand e-commerce site has already stopped selling semi-automatic guns online. 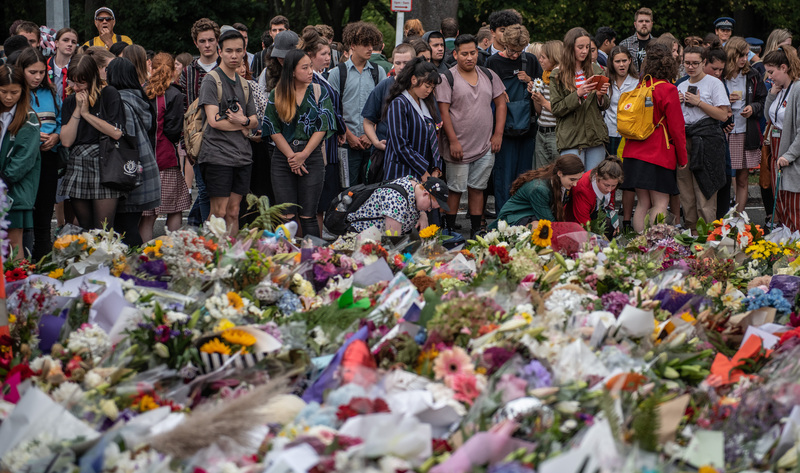 “We have listened to public sentiment following Friday’s terrorist attack in Christchurch and decided to remove all semi-automatic firearms sales and parts associated,” e-commerce company TradeMe wrote in a statement, according to CNN. Like in the United States, most guns in New Zealand do not need to be registered. The country does not require registry for most rifles and shotguns for people over the age of 16 with entry-level firearm licenses, according to Yahoo! News. Only about 4 percent of its guns are registered, according to researcher Philip Alpers quoted by The Guardian. New Zealanders possess an estimated 1.2 million firearms, meaning the country has a rate of roughly one gun per three people, according to The Guardian. That rate is much lower than the rate in the U.S., where some estimate there are more guns than people. An alleged gunman who attacked one of the mosques Friday wrote the name of a little girl killed in a 2017 terrorist attack on his rifle, saying his own attack was “revenge” for her death. The Australian man, 28-year-old Brenton Tarrant, has been charged with murder. He connected himself to the shootings after posting a manifesto on his childhood, his fear of white genocide and his desire to send a message that “nowhere in the world is safe,” reported The Guardian. “I chose firearms for the affect it would have on social discourse, the extra media coverage they would provide and the effect it could have on the politics of United States and thereby the political situation of the world,” the manifesto states, according to The Guardian.